Reputation.com, the online identity and privacy startup, has bought PaperKarma, a mobile app built to help users identify and then stop spammy snail mail. 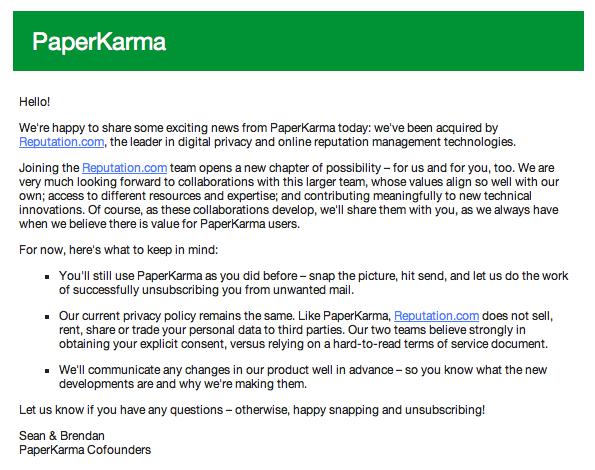 In a letter to users (embedded below), PaperKarma’s founders Sean Mortazavi and Brendan Ribera say that the app will continue to work as before; but Reputation.com notes that it will also be tapping into the startup’s software expertise for a wider remit: building up Reputation.com’s mobile capabilities, and applying PaperKarma’s address-tracking algorithms to online data as well. “With the addition of PaperKarma, we’ve added mobile capabilities to our portfolio that empower our customers to easily take control of unsolicited contact from vendors and marketers,” notes Reputation.com CEO and founder Michael Fertik in the official announcement. “At PaperKarma, we’ve focused on the green aspect of our app – but privacy services have always been on the roadmap,” Mortazavi and Ribera noted. “We’re excited to accelerate that vision by joining Reputation.com.” PaperKarma caused a bit of buzz last year when Apple selected it as one of the most disruptive apps of 2012, alongside Airbnb, Uber, Square Wallet, TaskRabbit and Hotel Tonight (pretty impressive company). While many associate the idea of “online reputation” with social media marketing and companies like Klout and LinkedIn with its endorsements and influencers, Reputation.com is tapping into another trend on the internet: the ideas of privacy, online identity, and safeguarding them. These are issues that have always been around, but for many users they still sit on the sidelines. For example, for all the people concerned with how much Facebook or Google knows about them, there are millions more who do not bat an eyelash. However, there are signs that might change: the news still emerging around the PRISM project from the NSA; the growing prevalence of ad tracking (and solutions to counteract that); the rise of “big data” repositories that collect and track information; and of course the numerous security breaches we have seen all point back to questions of online privacy and identity management. To that end, this topic could (and maybe should) become something all of us will think about more longer term. This is the second acquisition this year for Reputation.com, which in January acquired UK-based rival Reputation 24/7 to help expand internationally. As with the PaperKarma deal, financial terms of the acquisition were not disclosed but will involve “millions” in extra investment. Both deals are a sign of the company’s ramped-up ambitions in the wake of raising nearly $68 million in funding, including a $41 million round nearly two years ago, in July 2011, led by August Capital, with participation also from Insight Capital and previous investors Jafco Ventures, Kleiner Perkins Caufield & Byers and Bessemer Venture Partners. 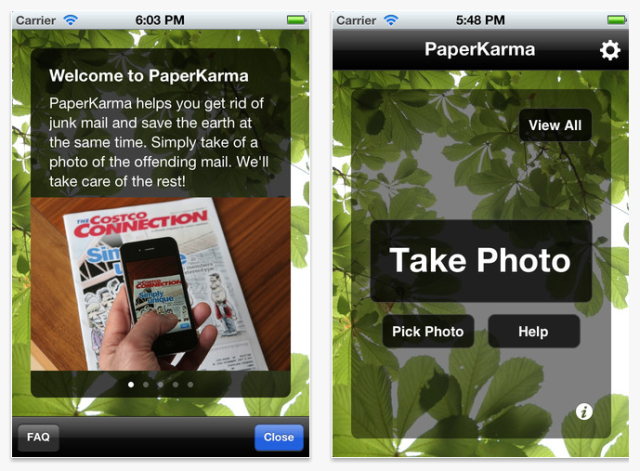 PaperKarma had raised an undisclosed amount of seed funding from SV Angel.